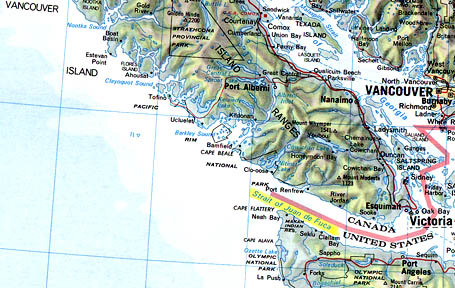 Juan de Fuca Ridge: 4,000 Small Quakes West of Vancouver Island, Feb. 27 – Mar. 4. One hundred miles west of the Strait of Juan de Fuca and Vancouver Island, British Columbia, Canada, 4,000 small earthquakes swarmed between February 27 and March 4, 2005. 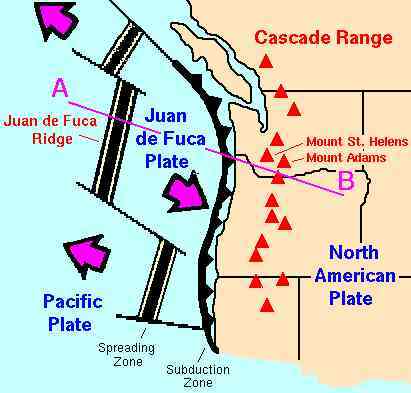 There, the Juan de Fuca Plate moves downward below the North American Plate along the seismically active Ring of Fire. A large motion downward of the Juan de Fuca Plate could push the North American Plate violently upward in a major earthquake and possibly Indonesia-sized tsunami. March 10, 2005 Newport, Oregon – An abnormally large number of small earthquakes swarmed in the Juan de Fuca region off Vancouver Island, British Columbia, Canada, between February and March 4. Then on March 8, 2005, Mount St. Helens released a 30,000-foot-high plume of gas and ash. Offshore, U. S. Navy hydrophones picked up at least 4,000 low magnitude rumblings over six days, which provoked university and NOAA scientists to recently dive down to the sea floor to check out what was happening. Of all the seismic regions off shore around the continental United States, the Juan de Fuca ridge is one that could have a subduction event in which plates violently slide over each other as they did in the huge December Indonesian event. If that did happen in Juan de Fuca, there could be a very large tsunami as well. To learn what the divers found, this week I talked with Robert Dziak, Ph.D., Associate Prof. of Oceanography at Oregon State University and geoscientist in the National Oceanic and Atmospheric Administration (NOAA)’s Pacific Marine Environmental Laboratory at the Hatfield Science Center in Newport, Oregon. Robert Dziak, Ph.D., Associate Prof. of Oceanography at Oregon State University and geoscientist in the National Oceanic and Atmospheric Administration (NOAA)’s Pacific Marine Environmental Laboratory, Hatfield Science Center, Newport, Oregon: “(The divers) found a lot of sediment stirred up in the area, probably from the large number of earthquakes during the swarm. Not a lot of hot water, though, that would normally be associated with a pile of lava on the sea floor. So, it’s very likely that this was a pure sea floor spreading event, tectonic event, where the plates are moving apart. It’s probably likely that magma was ejected at depth, but did not break through the (sea floor). COULD THIS SWARM POSSIBLY BUILD UP TO SOME LARGE EVENT? Again, this is a sea floor spreading event on the ridge and the plate that is being pushed apart is subducting the North American plate. Where it subducts beneath North America is where the hazard for the large earthquake and tsunami originates. So, they are on the same system. That is correct. But the linkage between the two is not very clear. And that’s what we are basically studying is to understand the system in better detail. Mt. St. Helens released steam and ash around 5:25 p.m. MT, about an hour after a 2.0 magnitude quake on the east side of the mountain, according to Bill Steele, Pacific Northwest Seismograph. 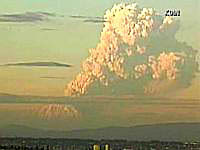 Video image © by KIRO7 TV, Seattle. USGS: “The boundary between the Pacific and Juan de Fuca Plates is marked by a broad submarine mountain chain at least 500 kilometers long (300 miles), known as the Juan de Fuca Ridge. The ocean floor is spreading apart and forming new ocean crust along the mountain valley as hot magma from the Earth’s interior is injected into the Juan de Fuca Ridge.” Graphics by USGS/Cascades Volcano Observatory, Vancouver, Wa. An Indonesia-Size Earthquake and Tsunami? HOW WORRIED ARE YOU AND NOAA AND OTHER SCIENTISTS ABOUT A MAJOR EARTHQUAKE HAPPENING THERE AND CAUSING A LOT OF DESTRUCTION AND LARGE TSUNAMI? Certainly it’s a concern and we’re doing our best the probabilities of these happening. Certainly, after the Indonesia quake, there is a lot more awareness of that, not only in the scientific community but in the public in general. So, we’re doing our best to study it and understand it. WAS THIS SWARM OF THE 6,000 UNIQUE IN MONITORING THIS REGION? It’s uncommon. It’s not unique. The swarms of that intensity usually occur every two to three years along different parts of the ridge. The Juan de Fuca ridge runs from Vancouver Island south all the way to Cape Mendocino off northern California. It’s a long system, about 1,000 kilometers. So, it’s essentially a long, linear volcano and so you could expect that different parts of it get active over different periods of time. Again it was an uncommon event that occurs about every two to three years. THEN THE PROBLEM IS THAT NO ONE KNOWS WHEN ONE OF THESE SWARMS MIGHT LEAD TO SOMETHING MUCH BIGGER? Correct. Once an earthquake swarm starts, you never know exactly how large it’s going to be or to what extent. But bigger in terms of more activity on the ridge, not necessarily bigger in terms of developing into a bigger earthquake on the subduction zone or anything like that. DO YOU THINK IT’S POSSIBLE WITH THE CURRENT TECHNOLOGY AND SCIENTIFIC KNOWLEDGE YOU HAVE NOW TO GIVE ADVANCE WARNING TO THE POPULATION THERE IF SOMETHING WAS BUILDING UP? OR WOULD IT BE ANOTHER BIG SURPRISE AS HAPPENED IN INDONESIA? That’s a tough question. Current technology ­ it is not really possible to monitor very accurately what is happening on the subduction zone. We do our best. We look at earthquakes. There are GBS monitors on the coast and they do see changes in ground motion and deformation. There may be some kind of warning. In other parts of NOAA, there is the tsunami warning system available and that would also be part of the warning process for a tsunami. Also, some of the best warning is just good education and to know that at least in coastal communities, if you feel a strong earthquake you should get to high ground in case there is a tsunami. IS IT TRUE – FROM YOUR MONITORING POINT OF VIEW WITH INSTRUMENTS – THAT THIS DOES SEEM TO BE A MUCH MORE ACTIVE THAN NORMAL SEISMIC TIME ALL AROUND THE WORLD?